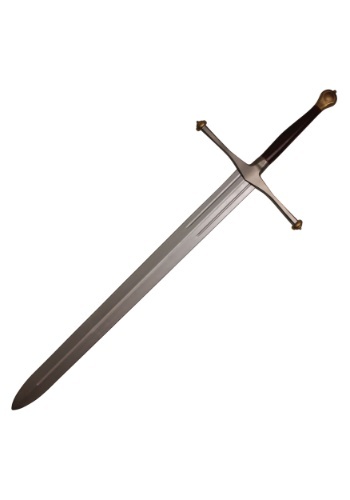 Blade is 38" long, grip is 15" long; total length 53"
After seeing the beginning of Game of Thrones, we wanted nothing more than to be the valorous Ned Stark. Such an honorable and stoic character! He even gets to wield the legendary sword Ice. Of course, the end of the first season came and… well, no spoilers, but he goes through a pretty rough spot of luck by the end of that season. We don’t really want to be Ned anymore, but we’d still like a chance to wield his awesome sword. The good news is that we found out about this Game of Thrones Ice Foam Sword Replica. It looks just like the one wielded by Ned Stark and it even comes with a collector’s box. It might not be able to slice a White Walker in two, since it’s made out of foam and not Valyrian steel, but it does feel pretty satisfying holding this bad mamma jamma.